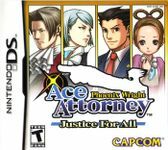 The second game in the Ace Attorney series. Originally released in Japan only for the Gameboy Advance platform, and later re-released for Nintendo DS in Japan, Europe, and US. In 2010 the game was ported to WiiWare. The plot of this game is a continuation of Phoenix Wright: Ace Attorney and features characters from the first game in the series. Justice For All features four new cases for the player to solve. The gameplay is very similar to the first game, with alternating Investigation and Trial sections. Most notable new feature is the Psyche Lock - presenting evidence to witnesses in the investigation phase, to uncover the secrets they are hiding.